I made super huge ones so I cut them in half and with help from a friend I tried to still make them look pretty around a bowl of dipping sauce. One of my favorite dishes in the whole world are spring rolls, but I was a little intimidated to make them at home. I finally got around to making these and I have to say it was pretty easy and fun. I felt like I was making a craft like origami because in the restaurants they always look so pretty and elegant. The secret to making these this first time, was to throw out any expectation that they would look pretty. Getting the flavors right was my main goal. The styling will come later with more practice. Use (cold) angel hair pasta for your noodles. Once I realized that I normally have all the ingredients for spring rolls in my fridge, I got motivated. All I needed to purchase was the rice paper which was about $1.78 Can you believe it? Three of these rolls usually cost about $7 bucks in a restaurant, so I'm always thrilled when I can have my favorite foods at home for a lot less. These were so much fun to make. I had B help me with the first one but he was thinking more along the lines of making a burrito, so that was interesting... Then I made one and it looked more like an enchilada! As I went along I made them slightly nicer. But I'm no Martha Stewart so I wanted to show you our messy rolls, which by the way were sooooo good. As far as instructions go, you can just add whatever you want into your rolls. I chose shrimp and some veggies. I meant to add mint but I forgot. Boo. 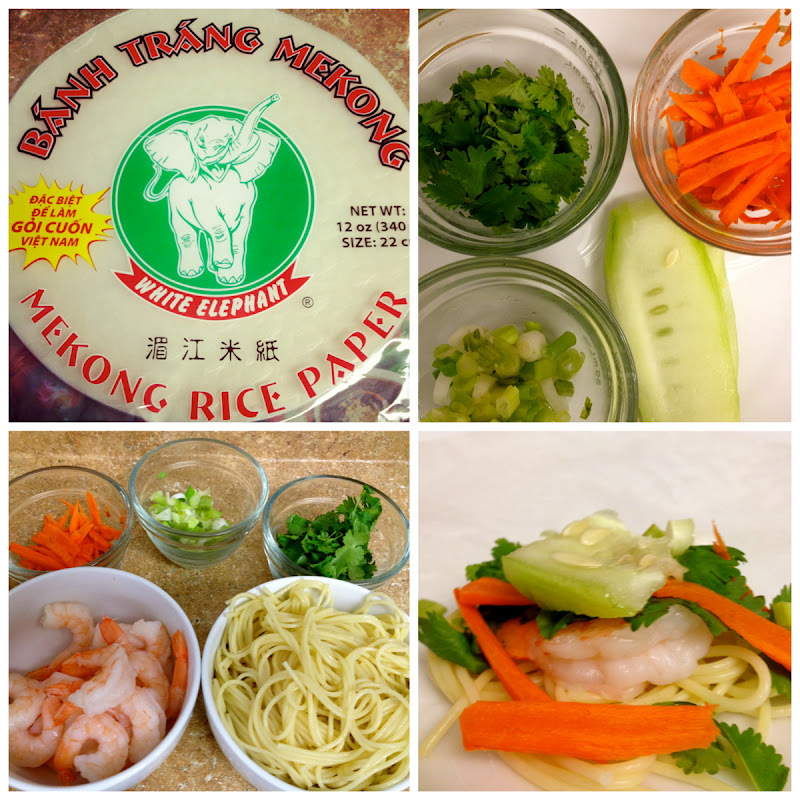 As Nicolle mentioned in her post, just follow the instructions on the rice paper which pretty much tell you to dip the rice paper in water and then top with your ingredients and roll! I'm excited to have added a new dish to my repertoire because I was in a culinary rut. Have you added any new dishes to your repertoire? Yours look GREAT! It's crazy how inexpensive they are to make. They are tricky to roll though, huh?! I hope to master that one day. I hope you loved the sauce. I think I might try a sweet sauce next time for a change? I love PB sauce, but I wish I could get mine as good as I've had in restaurants. yum! one of my favourite things to eat & make. yours look great! 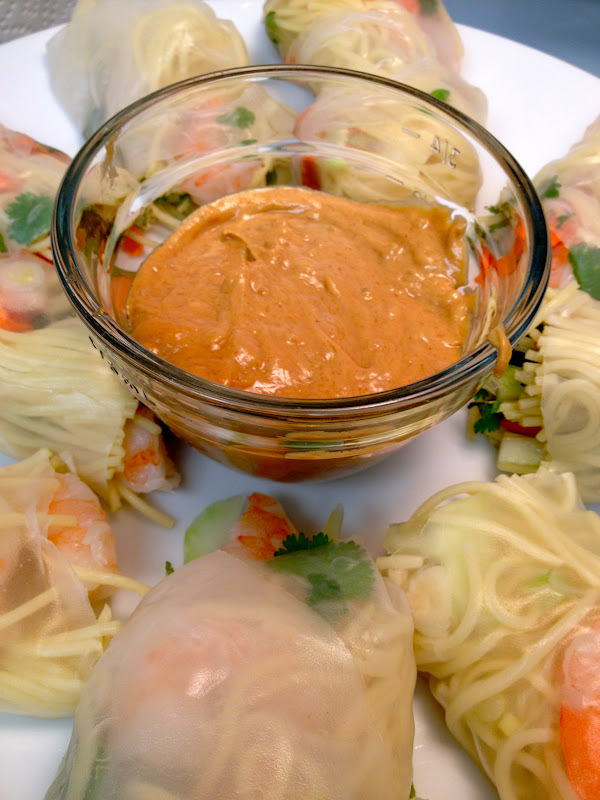 These look delicious - I love spring rolls - they so fresh, light, tasty & good for you! I tried that 2 ingredient apple angel food cake recipe recently. Its super sweet. They look delicious and so helathy too!